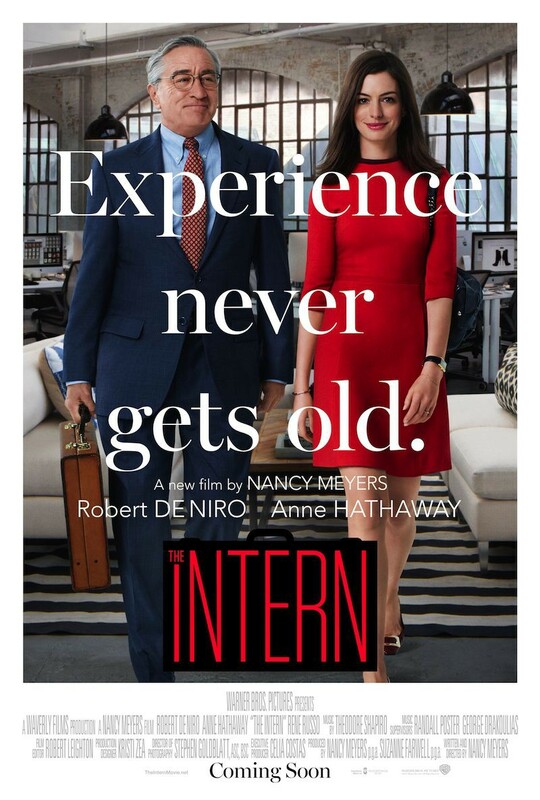 The Intern is written and directed by Nancy Meyers. I've enjoyed many of her films, especially The Holiday and Something's Gotta Give, so that was one plus in the movie's favor. Add in that it stars Robert De Niro and Anne Hathaway and I was ready to give it a chance even though the trailer seemed somewhat ho-hum. 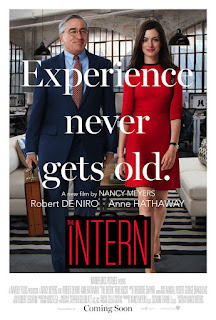 I'm glad I did, because I really enjoyed The Intern. I cried, because I am a big ol' softy at the movies, but I spent even more time laughing. It's a rather gentle comedy that relies more on character than event. (Although there is one hilarious scene that verges into slapstick involving an email that was sent to the wrong person. It's predictable but beautifully done.) The cast is game for it. De Niro inhabits Ben Whittaker wonderfully, taking on a much quieter persona than usual. Hathaway is an obvious choice for an ambitious, driven woman and she nails it. Not to mention they play off of each other quite well as the friendship between their characters builds. Jules is an entrepreneur whose internet business has been growing at an incredible speed. It means late nights and early mornings, little of it spent with her cute hipster husband and adorable little girl. It also means that the venture capitalists behind her site want her to hire an experienced CEO to make the site more corporate. Ben joins AtF as a senior intern. It's an outreach program by the company, and he takes it up because he's bored. Retired and widowed, he's done what he wants to in life and is left to find something new to fill up his days. He's a fish out of water at first, of course, but he and Jules find they both have qualities to offer each other. Part of what I enjoyed about The Intern is the female point of view that Meyers brings to the table. For instance, Jules is yet another female protagonist torn between balancing career and family and the movie doesn't automatically take the side that she should focus on being a mother. Meyers does have her shortcomings. The Intern takes place in an exceedingly, and rather unlikely, white Brooklyn. The strengths of the movie did outweigh that bum note, for me. I'm glad you liked this one because I thought it looked quite good and I hope to see it soon!